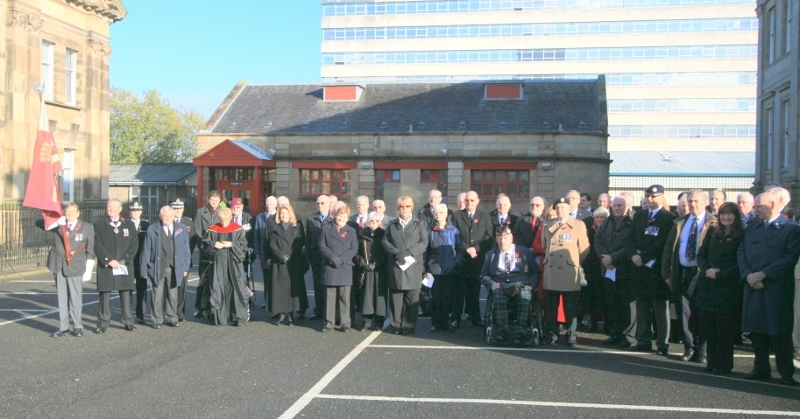 On Sunday 9 November 2014 the Annual Lanarkshire Constabulary Memorial Service was held at the Lanarkshire Police Memorial in the grounds of Hamilton Sheriff Court. The Reverend Georgie Baxendale, Motherwell South Parish Church, conducted the ceremony which was also attended by representatives of the Retired Police Officers Association Scotland (RPOAS), Police Scotland, Hamilton Sheriff Court and The British legion who all laid wreaths at the memorial. The service also saw the presentation of the Lanarkshire Constabulary Colours by Chief Superintendent Nelson Telfer, Commander of Lanarkshire Division, to the Lanarkshire Police Historical Society. The colours were received on behalf of the society and RPOAS (Lanarkshire) by our members Mr Joe McIvor B.E.M, Vice President of the Lanarkshire Police Historical Society, who then carried the colours at the memorial service, Mr Evan Mackay, President of the RPOAS (Lanarkshire) and Mr Peter Chalmers, President of the Lanarkshire Police Historical Society. The colours have now been donated to the society by Police Scotland and will be an integral part of our future exhibitions. The photograph shows those in attendance at the Memorial service.